Already a Real Estate Agent? 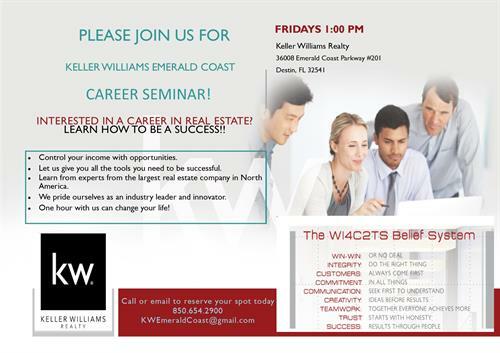 Interested in getting into Real Estate as a Career? Come Join us at our office in Destin to meet our team and learn about the Keller Williams difference. Learn how you can take home 100% of your commission check. Let us teach you the steps to become a licensed real estate agent and how Keller Williams can train you to achieve the success you desire. Licensed agents can set a private meeting with one of our team leaders. Call today and talk to Tom or Jamie to sign up or set an appointment.